John Gary contributed an essay to the Commercial Appeal's recent series on the Mississipppi River. 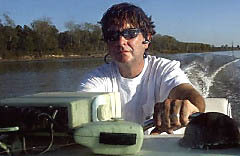 From it, you can savour the long-time river rat's love of the River and his hope for its future. It's reprinted here for your enjoyment. John Gary is Vice-President of Friends for Our Riverfront. The Mississippi River and I were already well acquainted when Mark Twain reintroduced us in the 8th grade. My father passed his lifelong love of the river on to me, and as a young boy, the river was where I really seemed to shine. Now, nearly 40 years later, I am still enthusiastic about the opportunities available by having one of the world's most spectacular natural attractions at the front doorstep of our city. It provides a welcome reprieve from the grindstone that consumes our lives. It offers an opportunity for regeneration, camaraderie and solitude that is becoming harder to find in our fast-paced world. Growing up on the river gave me a perspective outside my socio-economic caste, and gave me the nerve to work on a towboat right out of high school. People on the river tend to respect and pay attention to others without regard to who they are related to or where they went to school; instead, their value system is based on an individual's knowledge and respect of the river. River people will do extraordinary things for each other that would never occur in similar circumstances just "up the hill," such as taking an extra three hours out of an afternoon to give a stranded boater a tow back to the marina. This is the code of the river: Whether at work or play, you never pass someone in distress without trying to help. Even though you may only be minutes away from Downtown Memphis, being on the Mississippi River for any length of time tends to give a person the same sort of perspective he might gain having gone deep into the wilderness. You tend to pay closer attention to your surroundings, and your hearing sharpens and your eyes will catch things way off in the distance that you would have never noticed on land or even out on a lake. If you spend much time on the river you take safety seriously: you pay attention to the weather and the river stage, and make sure that you have plenty of fuel, water, matches, etc. You will find great pleasure in becoming more self-reliant. The river allows you to see lots of things differently; not just buoys, birds and fish. It is a giant laboratory with every science on display. You cannot help but be amazed as you learn about how it all works. You can witness the direct impact that storm water runoff has on our natural resources, and will make you think twice about what you put down your drain. The power of the river is truly extraordinary -- it extends from deep down below the surface of the water to a mile above, and well beyond its banks. There is plenty of evidence that the river influences our weather, and certainly it has an impact on real estate prices within sight of it. If just looking at the river from your office or Tom Lee Park can give you a moment's respite, just imagine the restorative power that comes from being on the river itself away from the sights and sounds, and yes the smells, of the city -- even if for just a few hours. I can tell you from my own experience that it never fails to send a chill up my spine when I find myself pointed upstream in the middle of the Mississippi River just below the "Big M" bridge. Whether the Mississippi River has enough to offer you to offset the initial time and expense required, and the risks, both real and imagined, is subjective. What I've seen with many "new" river people is a sense of adventure and accomplishment that's readily available at your doorstep. You don't need a brand new houseboat to start. All you need is a friend with a boat and a mutual sense of adventure. What you'll find is certain to amaze you. My father's greatest gift to me was passing along his knowledge and passion for the river. This week, as I celebrate the birth of my new son, I hope I'll instill in him this same passion for river-related learning and adventure that has benefited every aspect of my life.